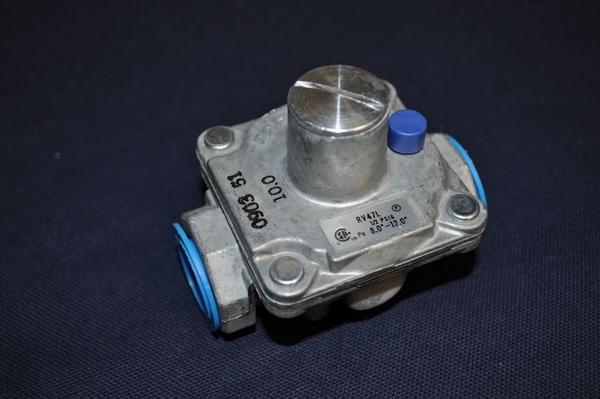 This regulator is designed for use in a system that uses LP gas. Its specifications are 1/2" x 1/12". It is set at 10" W.C. but is adjustable from 8 - 12. Regulators function in the supply line to modulate the high gas supply pressures present in the tank in order to deliver a steady low pressure that is appropriate for use by the appliance. A faulty regulator can have very negative effects on the operation of your system. Can the regulator be installed in the lower back corner or lower front corner of a propane fireplace? Can I use this propane regulator to tap into an existing propane lane in my basement so that I can install a ventless fire log set? This regulator can indeed be used to step down pressure to a log set. Most vent free log sets will come with their own regulator that is necessary to step down pressure. As such, you will likely only need to tap into your LP supply line and provide the necessary pipe stub to supply the log set. I needed it, they had it. This particular type of regulator was exactly what I needed to install a low pressure heating device. Right pressure range and right connecting ends. Perfect! Process was easy, and product got here in a reasonable amount of time. I like that it came preset to right pressure but you still have the ability to adjust it if needed. I Got Exactly What I Ordered , Pronto! Web site is easy to navigate with great prices with updates.